Just thought I would add this on it's own also I added in the mdm theme section but that's more for developers making them. AREA51 mdm theme finally finished. Woohoo I finally got some time to plow through it and got it done finally. I might make some minor changes later on if folks don't like the placement of the users list but other then that, I got er done. I tested it on my system and it worked fine. Here it be for you all to check out if you want. I had to zip it up as deviantart does not allow tar.gz files on their site but I added instructions on how to install it in the read me file. I'll be adding all new mdm themes to this github from now on. I'll have to play around with that animation editor when I have some free time. Yeah, I'll need to Bookmark this...sam is very good. I'll need to join DevianArt also. Love those wallpapers also, need a KDE one! lol. Really like the SteamMetal one, make one with KDE in it sam lol. Not into Flames but really like the darkCarboniteSolydXK themed Wallpaper. Nice system but it slows me down with all the bells and whistles, I use xfce or cinnamon lately just cinnamon I might go back to mate one day. I like my old school style and a desktop I can mess up alot with files while working. I'll see how much work will be involved and see if I can toss a quick one together whats your resolution? Remember if anyone wants to make mdm themes themselves use the phaser editor, there is donation nag screen but it's not timed so you can use it with it, for me I paid to get rid of it cause the person who developed is good and I like to see him keep going on with it but also it's quick and cuts down the worktime at least by half for me and the canvas finally works with mdm using it anf the phaser game framework. Don't put yourself out brother, I shouldn't have even asked. I don't have a clue how much work something like that would be LOL. I very much like them though and am a big fan of Wallpapers! The MDM is awesome also so will give that one a go. Your Wallpapers: Why are they so Tall, they don't look like wallpapers I've downloaded before? Like there is one on top of the other. Is the download Straight forward? The Resolution on my KDE is 1280x800. I'll bet if you made some KDE, Mate and Xfce for Mint they would be very popular here! 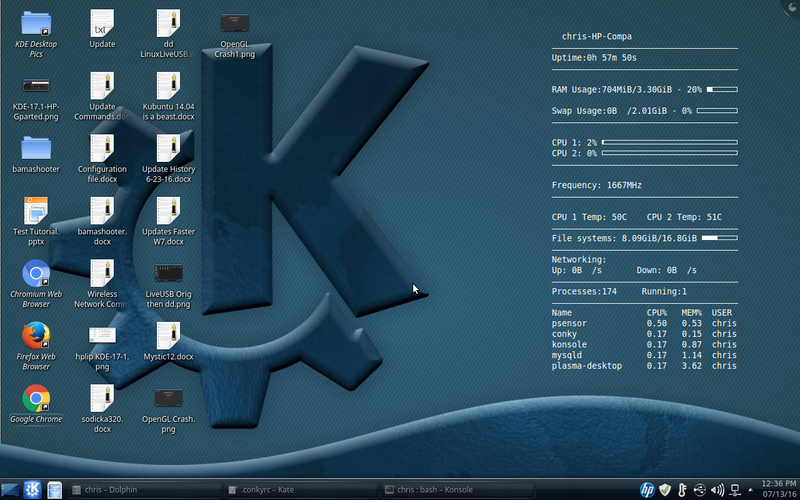 Here is a link to my KDE now, albeit cleaned up now. KDE: Yes, slower...but it is soooo freaking awesome! I also use Mate, and getting ready to install Mate 18. If I had more resources would install Xfce also, and I still may do that. for the tall ones, I was making the graphics for solyd back then so it just shows the image for both kde and xfce versions you have to click on the download button on the side to get the zip file where they are separated, that's just to show what both look like, alot of folks that use solyd use both formats that's why I added both in one download. I'll see if I can grab some time to make a wallpaper for it, it won't take me long to make that one, its a carbon one they usually only take a hour or so if that to make, I'll make it bigger though for those with higher resolution but within your ratio so when it resizes it it will fit yours nicely. I'll post here once done for the link. Thank you, that does look really nice. I will install this shortly. Can you provide this for systems using the new SDDM as well, for the new Linux Mint 18 KDE? I don't know much about the details of the login screen theme. Is there a way to convert an existing looping video/animation into an HTML or whatever file to create this? Just curious. I have no problem making looping animations, but I don't know how to convert them into something Linux Mint can use. Hey phd21 no go on SDDM it's written in C++ using QML for it's theming, a whole different ball game, I stop programming in C++ around 2000 - 2004 somewhere in that area I could do QML for it's theming but I have to read up and go that route a bit much for login themes although it only took me a couple of nights to start making themes for kde framing before, but this might be a different one, I never really got that far into it yet. Racer and phd21 these are strictly html5, the same code you use to make websites with I just use phaser's gaming framework and Arien's phaser editor to make them in because he did a great job and it makes life a whole lot easier. We had a big issue with getting canvas to work at first also some worked some did not, that's why I use phaser's framework, it just works no matter what. That's why all the first mdm's I made did not use canvas except for a couple that did work. Just remember not to make it too big folks don't like waiting to long to log in, that's why I never animated the doors to open in this one once you log in, they would of had to wait until they opened before it moved to log them in, make it quick and just something to look at the ole KISS method works the best when making these things. Probably the most crazy detailed one I want to make is sort of a night time avatar movie type with the plants animating,changing color etc, I just want to see if I can do 90% of it in code to cut down loading and animation times or else it'll be insane for a loading theme loading all those images and animating a ton of pngs. Lets take your animation video if you made a full screen spritesheet and each frame was a full screen about 2 mb's each on 50 frames at least for a decent movie type loop (which is very small) that's at least 100mb just to load the login screen, to load the cache of images. Phaser 3 is coming out with webgl batch loading for sprites which makes it insanely fast , I'll test it on mdm once it comes available, but I'll have to get someone with lmde to test it on that version that doesn't mind going in through the backdoor to fix it if things go wrong, they just have to change the theme name in login file but they will need an install usb to get in if it goes wrong. I hope webgl works now everywhere it'll be a fast loading if it does. Grabbed it sam, thanks! It is awesome, really like your work. Great work, Sam.This is of such quality that I for one would like to see it added to future Mint releases.